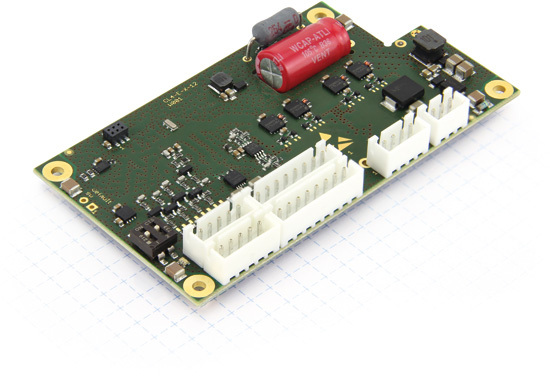 The CL4-E motor controller from Nanotec is suitable for both brushless DC motors and stepper motors and has a peak power of 1050 W. The rated current of this controller is 6 A, additional heat sinks are not required. The motion controller can be controlled via CANopen and Modbus RTU or programmed for stand-alone operation and be controlled via digital and analog inputs. The product is designed for field-oriented control by encoder, Hall sensors, or sensorless. Due to speed and acceleration feed-forward control, it offers significant improvements over PI controllers in terms of reference behavior and dynamics, said the company. Additional safety for the tolerances of 48 V battery packs and power supplies is provided by the 58 V operating voltage. The controller can be parameterized and programmed with the company’s free Plug-and-Drive Studio software. Nanotec, member of CAN in Automation since 2004, was founded in 1991 and is manufacturer of motors and controllers for industrial automation and medical engineering. The company has been based in Feldkirchen near Munich/Germany since 2011. With some 200 employees in Germany, Bulgaria, the USA and China, they serve customers around the world. Nanotec (Germany) has adapted the Robot Operating System (ROS) to its motion control products.